The 2018 Winter Olympics in Pyeongchang, South Korea starts this Thursday. The Winter Olympics has less sports than the Summer Olympics and with it a smaller audience. The names of the sports of curling and speed skating are well known, yet their rules are not. Curling is a team sport that is played on a sheet of ice. Most people compare curling to shuffle board, only on the ice and with a team. The teams of four players push a 40 pound granite rock down the ice and try to get it as close to a target as possible. Two teams compete against each other, and the team who gets closest to the target wins. One player throws the rock and the others sweep in front of it to try and help the rock keep straight and hit the target. If no one swept in front of the rock then the rock would curl, or veer left and right. The sweeping keeps the rock straight. Each team throws sixteen rocks, with each player throwing twice. Scoring the game is the team who has more rocks closer to the center than the other team. When people hear the sport of speed skating they think that it is pretty self explanatory. Speed skating is essentially track on ice with players skating around the ice arena at different distances. The races are separated between men and women with 7 different events, 5 individual, 1 team pursuit and 1 mass start. The team pursuit is when three athletes start on opposite sides of the oval and skate six or eight laps. The winning team is the team who has all three athletes cross first. The winning team moves on to the next round and the losing team is eliminated. The mass start event is a sixteen lap race where all 24 athletes race at once instead of only having two athletes racing in elimination style. Mass starts also have sprint points which athletes can gain during laps four, eight, twelve, and sixteen. In each of these laps the top three finishers get extra points. These points are added to the points that the first, second, and third place athlete get. The Winter 2018 Olympics are starting in less than a week and there are many sports to watch that are not always in the spotlight. Curling and speed skating are two of them that will be in the spotlight over the next two weeks. The Winter 2018 Olympics in Pyeongchang, South Korea are a week and a half away. One of the most popular sports events to watch is snowboarding. When most people think of snowboarding they think of freestyle where the snowboarders perform tricks similar to skateboarders on a halfpipe. 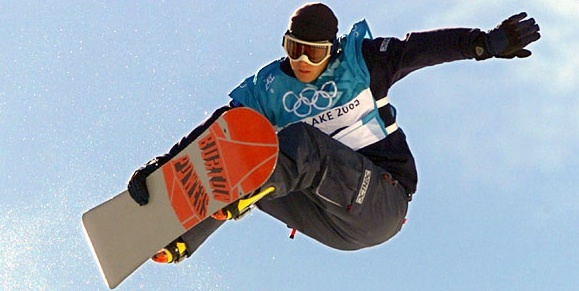 There are many different types of snowboarding events at the Winter Olympics. There is giant slalom, cross, slopestyle, big air, and halfpipe. Each event is separated into men and women competitions. In giant slalom, two athletes start and snowboard down two separate courses and whichever athlete gets to the bottom the fastest wins. The two courses are not identical, but parallel to one another. While snowboarding down the course there are at least 18 gates that the athletes must go through. The snowboard cross is a team event. The teams are of four or six athletes who race down a course and the team with the fastest time wins. After the first round, the top two to three athletes from each qualifying team compete in the finals. The course that the athletes snowboard down has a variety of obstacles such as banks, rollers, spines, and jumps. Slopestyle snowboarding is on a course that has various obstacles that athletes can choose to use in competition. This event is scored by six judges who judge based on the athletes height, rotations, techniques, and degree of difficulty in their performance. A perfect score is 100 points. The obstacles that the athletes can choose to use are rails, tables, boxes, walls, and jump pads. Slopestyle is similar to halfpipe in that both are not just snowboarding down a hill. The big air event is similar to the most popular, halfpipe event. Athletes snowboard down a hill and perform tricks after launching off large jumps. The athletes do complex tricks while trying to look secure and make a clean landing. Depending on the competition, there are certain tricks that are required for each athlete in order to place well in the competition. The halfpipe event is the most popular event that the public watches. The athletes perform jumps, rotations, and twists in the air as they snowboard across the halfpipe ramp. There are six judges that judge based on the height, rotations, techniques, and difficulty of their skills. A perfect score is 100 points. Each athlete gets to perform twice and the athletes best score of the two is used. Snowboarding is one of the most popular sports in the Winter Olympics, with the main focus being on the halfpipe event. While this event is very popular and skilled, there are other events in snowboarding that can be glossed over. The Winter Olympics are two and a half weeks away in Pyeongchang, South Korea. 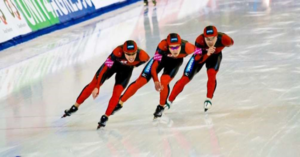 The Olympic qualifier competitions for most sports have ended and the athletes are preparing to travel to South Korea to compete in the highest level of competition in the world. 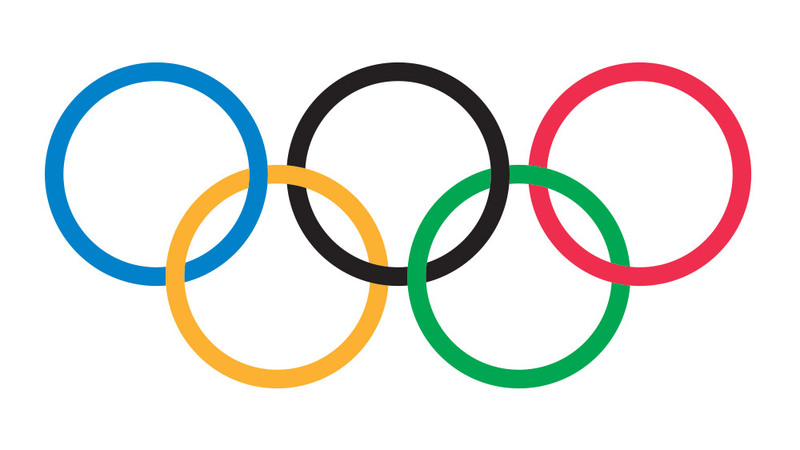 The Winter Olympics have less sports than the Summer Olympics, and most of them aren’t as well known to the public. One of the sports of this nature is the biathlon. The biathlon is a mixture of cross country skiing and marksmanship with a rifle. A biathlon is is similar to a triathlon except, as one can probably tell by the name, there are only two events instead of three. The athletes cross country ski through a trail/course and stop two or three times to shoot at targets in different positions. Depending on how many shots it takes to hit the targets time is added to the athletes score. The person with the fastest total time wins the race. The two positions that the athletes shoot in are standing up and laying down on their stomach, which is called prone position. The athletes have to hit five targets at each stop. If an athlete misses a target then they can choose between three different punishments to do that will add time to their total score. They can either have one minute automatically added to their time, ski a lap which is usually about 150m (it takes the best athletes about thirty seconds to do this), or they can shoot three extra times and at the end they have to complete a loop for every target they did not hit. These two sports separately don’t seem to go together at all, they are two very different skills. One generally never needs a rifle whenever they go skiing, unless they are hunting. This sport reminds one of what people in the cold climates would have to do for food in a time before industrialization. These athletes have taken what used to be a necessary skill to survive in some parts of the world and have made a sport out of it. 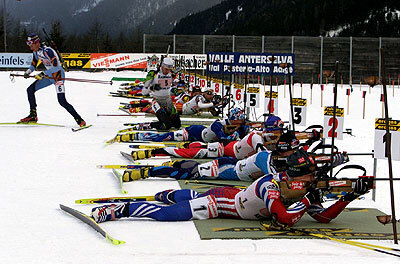 A Biathlon requires the athletes to be equally good at both skills. If one is great at skiing but a poor marksman they will have to ski much more for every shot they miss which would take much longer than if they had originally hit their target. Similarly, if an athlete is a great marksman and not as good at cross country skiing then they will get to all of the target areas late and this will negatively affect their time. This requires all of the athletes to be excellent at both seemingly unrelated skills. Athletes who compete in the biathlon races at the Olympic level are outstanding in both sports and could probably medal in marksmanship and cross country skiing individually. But instead they compete together, which shows an extra ability and skill. The biathlon will be a sport to watch in the 2018 Winter Olympics that doesn’t get much attention at any other time or place. The Winter Olympics are getting closer and people are beginning to pay more attention to the sports that will be featured in them. Most of these winter sports are only highly publicized every four years during the Olympics. An example of this is the sport of bobsledding. 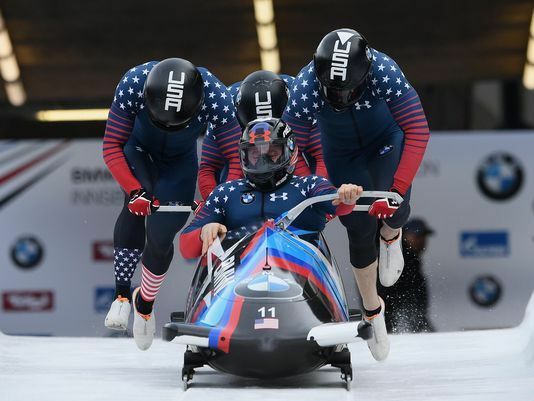 Bobsledding is a sport that most people have heard of and know the general concept of what it is without knowing many details about the athletes or logistics and scoring of the sport. The sport gets minimal media attention, even throughout the Olympics because it is overshadowed by figure skating and snowboarding. 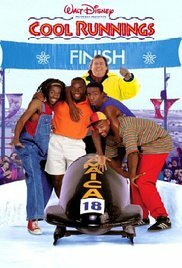 There has only been one movie made about bobsledding, “Cool Runnings”. It is about the first Jamaican bobsled team and how they were formed, practiced, and eventually made it to the Olympics. The movie shows the basics equipment, requirements, and skills needed to compete in the sport. 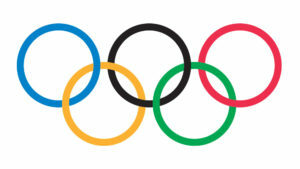 It also states the basic rules and possible qualifying times to make it into the Olympics around 1993. It is more of a fun team building and friendship movie than an informative bobsled movie but it did help to expose more people to the sport. In all bobsleigh events there is one driver and at least one other person in the sled to help with the momentum of the sled as it travels through the course. The driver has to turn the corners and lean the sled at the perfect angle for the sled to not lose momentum during the race, and the other members in the sled have to lean along with it to make the sled steady. The driver of the team has to memorize each course and the angles of every turn to be prepared before he/she even gets to the event. There are three different bobsleigh events: four man, two man, and two women. The four men race can be man and/or women. The four man bobsleigh event has been a part of the Winter Olympics since the first one took place in 1924. The two man bobsleigh was added in 1932 at the third Winter Olympics, and the two women bobsleigh was added in 2002 at the nineteenth Winter Olympic Games. 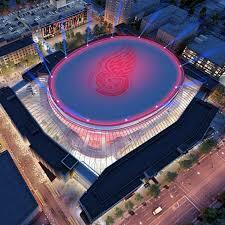 For the 2018 Games the center that the race takes place is also the venue of the luge and skeleton races. All three sports use the same track with the course length being adjusted per sport. All of the bobsleigh events use a course length of 1,376.38m, or 0.86 miles. The average slope of the track is 9.48%. Bobsledding is only one of the many sports that are only in the spotlight during the Winter Olympics. Even during the Olympics they are still overlooked and out shined by other sports like snowboarding. But throughout the years the viewership has risen thanks to the movie “Cool Runnings”, and with time it will hopefully become more popular. The winter Olympics are in February, and the big sport to watch is always figure skating. There are so many variations (women, men, couples) that figure skating will be on for the entire two weeks of the Olympics. A big change has been made to the figure skating rules that the audience will surely notice. The skaters are now allowed to have words in their music for their routines. This will create a new dynamic to the figure skating competitions. Popular figure skating music in the past has been to popular music that is easy to recognize without the words. This includes popular movie soundtracks like “Pirates of the Caribbean”, or popular songs from musicals like “The Sound of Music” or “Fiddler on the Roof”, or even popular hit songs like “If I Were a Rich Man”. Classical music is also a popular choice for figure skaters. These songs appealed to the crowd because they could enjoy the figure skating routine and the music. The International Skating Union allowed for words to now be incorporated in their music to try and innovate the sport. Figure Skating was losing viewers and made this move to try and attract some new fans. Now the skaters can skate to new and popular music that more people can recognize. Some skaters, like Jimmy Ma, are embracing the change and skating to very modern music. Ma has performed to an Eminem medley and to “Turn Down For What” in the past two years. He has said that his choices of music is to bring in more fans and to show that figure skating is a cool and modern sport. His goal is to turn some heads and get people to pay more attention to ice skating. Others music choices aren’t so bold, they still have lyrics in their routine but nothing too modern or different for the figure skating world. Though many are embracing this new rule, it is not a requirement. Skaters can still skate to instrumental music, it depends on each skaters preference.